It’s their eyes that stay with you. They convey what language barriers hinder, bringing into focus the plight of Yemenis who fled their war-torn country and are living in the Markazi refugee camp in northern Djibouti in East Africa, across from the Arabian Peninsula. The Markazi camp's makeshift preschool, where Yemeni refugee children ages 4 to 5 learn the alphabet and numbers in Arabic, and have time to sing, draw and play. The eyes of 29-year-old Mariam Hassen and 39-year-old Ersal Ismael that pierce through their niqabs, as Hassen cradles Kadria, her 7-month-old daughter suffering from severe acute malnutrition, and Ismael clutches her mobile phone that’s a lifeline to family members still living in Yemen. The eyes of the refugee children – Kadria staring up from her mother’s arms, and preschoolers sitting on the floor of their makeshift school – that reveal a sadness or weariness belying their ages. 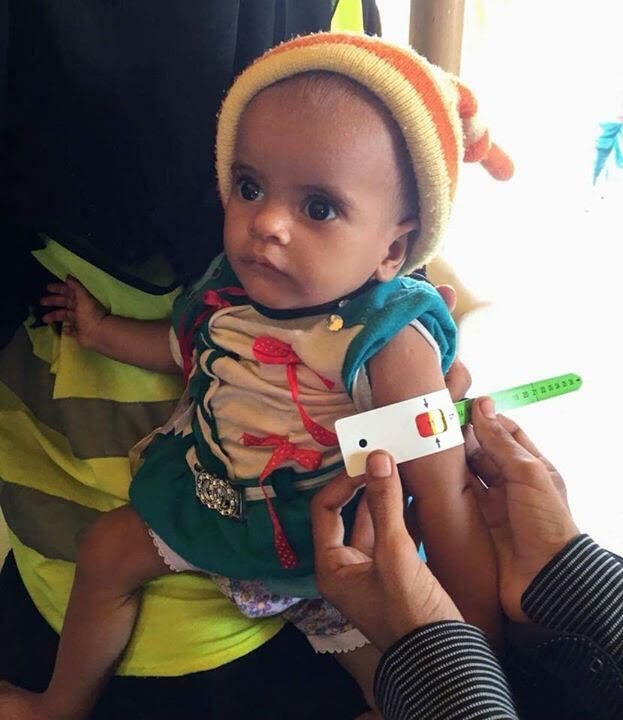 Yemeni refugees trained as social workers at the Markazi camp measure the mid-upper arm of 9-month-old Moona Niazi, who, based also on her height and weight, was deemed to be suffering from severe acute malnutrition. “I just dream to be a woman in this world – a simple dream,” said Ismael, who arrived at the refugee camp in August 2015. Some 1,250 Yemenis live in tents and huts in the remote and dusty 42-acre Markazi refugee camp just outside the desert town of Obock, where the temperature reached almost 110 degrees on a late September trip with the United Nations Children’s Fund. Refugees escaping Yemen by boat cross the Bab-el-Mandeb strait – the “gateway of tears” -- or the Gulf of Aden to reach Djibouti, a coastal country on the Horn of Africa. Yemen has been engulfed in a civil war that’s devastated the Middle East’s poorest country. A Saudi Arabia-led, U.S.-backed military coalition supporting President Abd-Rabbu Mansour Hadi has been fighting since 2015 to force the Iran-allied, Shiite Houthi rebel group (loyal to ousted president Ali Abdullah Saleh) from the Yemeni cities that it’s seized—including the traditional capital city of Sana'a. The conflict is blamed for the deaths of more than 10,000 people and the displacement of more than three million. It’s left Yemen close to famine and resulted in a massive cholera outbreak in what the United Nations has called the world’s largest humanitarian crisis. A quarter of Yemen’s 28 million people are starving, and a half million children under the age of 5 are severely malnourished, according to the UN. Ismael, who taught French from home in Yemen, paid $100 each for herself and now 18-year-old son to take an approximately 11-hour journey by boat to Djibouti. “There is no other choice,” she said through an interpreter, in the sparse tent where she now lives. She and her son had been residing in the Crater district of Yemen’s port city of Aden, which in 2015 experienced aggressive ground fighting and aerial bombardments. There were rumors that Crater’s water supply had been poisoned, and Ismael worried her son would be taken by resistance fighters and used as a child recruit. Her oldest sister remains in Yemen with her children and grandchildren. This woman and her young daughter are among approximately 1,250 Yemeni refugees living in the Markazi camp. “They say it is very difficult, and they would love to come to here, because they don’t have any means to eat even,” Ismael said. UNICEF, the first aid group to gain access to Yemen after the war started, oversaw $47.7 million in emergency aid procurement for the country last year. Limited access to Yemeni seaports and airports since March 2015 prompted it to open a logistics hub in Djibouti, the closest point from which aid can be shipped safely, according to Etleva Kadilli, director of UNICEF’s Supply Division headquarters in Copenhagen. Since March, almost 2,500 metric tons of supplies have been sent to Yemen aboard fishing dhows and charter flights. “We haven’t had any incidents, knock on wood,” Kadilli said. UNICEF transported 28 tons of Yemen-bound emergency aid to Djibouti in September, including essential drugs, water purification tablets and community kits for the treatment of watery diarrhea and cholera. Norwegian Air provided a new Boeing 787-9 Dreamliner for the special humanitarian aid flight from Copenhagen, where UNICEF operates the world’s largest humanitarian aid warehouse. The aid arrived in Aden by boat on Oct. 8, bound for Sana’a for distribution by UNICEF-sponsored trucks. UNICEF and Norwegian Air also have collaborated on humanitarian aid flights to the Central African Republic, for Syrian refugees in Jordan and to Mali since 2014. “We try to find trips that haven’t been so much highlighted in the media, that are a little bit forgotten, and they have maybe even more needs, because there is nobody there to commit supplies and medical and nutrition aid,” said Norwegian founder and CEO Bjorn Kjos, who has flown on all of the aid flights. But Ismael sees no hope on the horizon for an end to the destruction in Yemen, which world powers largely have ignored. Yemeni refugee women and children in the Markazi camp's nutrition tent, which runs a blanket feeding program for children ages 6 months to 5 years and pregnant and lactating women. It also provides vitamin supplements and promotes the importance of exclusive breastfeeding for up to six months with adequate supplementary feeding. Conditions also are relatively harsh at the rudimentary Markazi camp, which has 154 functioning latrines and 144 showers. In addition to the searing heat, the refugees endure wind-driven sandstorms. Female refugees have been trained as social workers to help assess health and nutrition needs, including whether children are malnourished based on their height, weight and mid-upper arm circumference. The camp reported twelve cases of severe acute malnutrition and nine cases of moderate acute malnutrition in late September. Many refugees choose to leave the camp and return to Yemen. Since the camp opened in April 2015, about 1,700 families have gone back to Yemen despite the ongoing conflict, and some 100 families have left for Somalia. Sixty-five-year-old Ali Aman, a retired architect and urban planner from Aden, has been living at the camp for 29 months. The war started soon after he retired, and his house was destroyed. He left behind three adult children. "The only thing here available all the time is the water…but no green,” said Aman, likening the camp to living at the bottom of a well. To make a donation to UNICEF, please visit www.unicef.org.